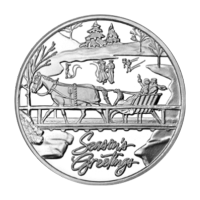 1 oz Sleigh on a Bridge Holiday Silver Round | ?? 正面 A sleigh on a bridge with people skatting in the background and the words "season's greetings". 反面 A Giant snowflake surounded by smaller snowflakes, christmas decor, with the coins weight, and purity atop.